Crayfish from the Neotropical region comprise a unique group among crustaceans. Their burrowing habits have severe consequences for many ecological, morphological, and behavioral traits. Although they are all considered true burrowers, the degree of these adaptations and their relationships to the behavioral repertoires of these crustaceans have been discussed for a long time, although with no consensus. To address this situation, we performed behavioral observations of Parastacus brasiliensis in a laboratory environment. Animals (n = 7) were isolated and acclimated in experimental aquaria according to their size (two large and five smaller aquaria) and observed for seven days at four different times of the day (twice during the day and twice at night). Their behaviors were qualified and quantified. The time spent inside and outside the burrow was also observed and analyzed with a t test for paired samples. Their circadian activity was analyzed using Rayleigh's Z test. Animals spent 54.9% of the time hiding within the burrow and also remained longer in it during the day than at night. They spent more time active outside the burrow during the night. These results suggest that these crayfish are nocturnal and are definitely not a part of the lotic species group. This species appears to be closely associated with its burrow but can exhibit considerable activity outside of it and can therefore be classified as a secondary burrower. Although this is a laboratory study, the results may stimulate further studies on the importance of burrows to these animals and provide basic background information for new studies on these cryptic crustaceans. Crayfish are among the most widespread freshwater decapods, occurring naturally on every continent except Antarctica and continental Africa (Breinholt et al. 2009). They occur in streams, rivers, lakes, caves, marshlands, and even in areas away from surface water (Nyström 2002; Richardson 2007). The species in these last situations are called burrowing crayfish, and they build extensive underground burrow systems, in which they spend most of their lives (e.g., Buckup and Rossi 1980; Hamr and Richardson 1994; Punzalan et al. 2001). Living in a burrow and remaining confined within it most of the time clearly affect the life-history traits of these organisms (Hamr and Richardson 1994; Richardson 2007; Dalosto et al. 2012). These burrows provide most of the resources needed by the crayfish, such as food, protection from predators, and against desiccation (as suggested by Hamr and Richardson 1994). On the other hand, they also impose several constraints on foraging excursions and, especially, the reproductive behavior of these crustaceans. These crayfish have very few opportunities to disperse, as the environmental conditions outside their burrows are harsh (Richardson 2007; Dalosto et al. 2012). The behavior of these fossorial animals greatly differs from their open-water, non-burrowing relatives, which are solitary and very aggressive animals (Bergman and Moore 2003; Crook et al. 2004; Moore 2007). The environmental pressures faced by burrowing crayfish strongly favor coexistence and overlapping generations. Evidence supporting this assumption includes gregarious tendencies (Punzalan et al. 2001), low aggressiveness (Guiaşu et al. 2005 Dalosto et al. 2013), and prolonged parental care (Dalosto et al. 2012). However, even though burrowing species behave differently from other crayfish, very little is actually known about them mainly because their fossorial habits make sampling difficult (Punzalan et al. 2001; Richardson 2007). South American crayfishes comprise an independent radiation of parastacid crayfish, with a disproportionately high number of burrowers, as 12 of the 13 known species (Rudolph and Crandall 2012) are considered true burrowers (primary/secondary burrowers sensu Hobbs 1942) (Buckup and Rossi 1980; Noro and Buckup 2010; Silva-Castiglioni et al. 2010, 2011). However, there is no consensus regarding the degree of association with burrows of each species. In Parastacus Huxley 1879, the largest and most widespread genus in South America, Noro and Buckup (2010) considered all species to be primary burrowers, whereas Silva-Castiglioni et al. (2010, 2011) made a clear distinction between the life habits of Parastacus brasiliensis (von Martens, 1869) and Parastacus defossus Faxon 1898. In addition to this contradictory evidence, none of those studies actually investigated their behavior. Therefore, it is necessary that the life habits of these species and their relationships to the burrow system be elucidated in order to establish proper conservation priorities. This is a matter of concern for two reasons. First, freshwater environments in South America, including the wetlands where these parastacids dwell, continue to be degraded (Buckup and Bond-Buckup 1999). Second, it is important to understand the basic aspects of an organism's behavioral biology so that we can then proceed to understanding how it reacts to environmental disturbances (Monteclaro et al. 2011). Additionally, crayfish are widely used as behavioral models (Guiaşu and Dunham 1998; Gherardi 2002; Moore 2007), but this suggests the erroneous conclusion that the behavior of all crayfish is already known, leading researchers to ignore particular traits of a given species (Lundberg 2004). This is especially of concern given that burrowing crayfish are highly specialized animals, as clearly reflected in their behavior (Dalosto et al. 2012, 2013). One useful tool that may help better understand the species' behavior is the ethogram (Altmann 1974; Lundberg 2004), especially when applied to animals with more specialized habits, such as Parastacus. Herein, we studied the behavior of P. brasiliensis; this species is considered the most ‘lotic’ of the genus, being more often associated with low-order streams than wetlands, although it can also live in marshlands (Buckup and Rossi 1980; Fries 1984; Buckup 1999, 2003; Silva-Castiglioni et al. 2010, 2011). This is also the species of Parastacus with particularly uncertain burrowing habit. In the present contribution, we describe the behavioral repertoire of this species under laboratory conditions. The observed repertoire was then related to the habits of the species and was compared to published assumptions regarding their behavior. Seven specimens of P. brasiliensis were collected (in October 2009) through manual search in a marshland in the municipality of Silveira Martins, Rio Grande do Sul, Brazil (29°39′25.14″S, 53°37′33.53′W). Only adult crayfish in the intermolt stage and with all appendages intact were selected. The animals could not be sexed because species of this genus possess permanent intersexuality and lack clear patterns of sexual dimorphism (Almeida and Buckup 2000; Silva-Castiglioni et al. 2008; Rudolph and Verdi 2010). They were transported to the laboratory, where the carapace length (CL; mean, 21.89 ± 2.5 mm, Table 1) was measured, and they were allowed to acclimate for 5 days in individual, opaque, 2-L aquaria with constant aeration, and were fed every 2 days. After the acclimation period, they were transferred to the experimental aquaria. Indiv, individual. aSignificant p values. The crayfish were placed in individual glass aquaria with the aquarium size corresponding to their carapace length [two 48 × 32 × 31-cm aquaria for the larger crayfish (individuals 6 and 7, Table 1) and five 28 × 16 × 16-cm aquaria for the remaining animals: individuals 1 to 5]. These were designed to represent the animal's natural environment, with 1/3 of the area covered with 10 cm of mud and clay (simulating a riverbank, where burrows of this species can be found; see Fries 1984) and 2/3 with water and a layer of gravel. The crayfish were allowed another 3 days to acclimate to the new experimental aquaria, as the excessive activity observed in this phase could have biased the results. Behavioral observations were performed after the third day, through the focal animal method (Altmann 1974), in 10-min sessions with a 5-min interval between sessions, resulting in a 2-h sample where each animal was observed twice. These observations were performed four times a day, twice at night (at 2400 and 0600 h) and twice during the day (at 1200 and 1800 h). This procedure was followed for 7 days, with the animals being fed fish pellets every other day, alternating between day and night to avoid bias (e.g., the first time they were fed at 1200 and the next time at 2400). During nocturnal observations, red incandescent light bulbs (40 W) were employed, as decapod crustaceans have low sensitivity to this wavelength (Turra and Denadai 2003; Zimmermann et al. 2009; Ayres-Peres et al. 2011a). The aquarium was covered with parchment to avoid behavioral bias caused by the observer. The time the animals spent within or outside their burrows was also recorded. The time which a crayfish remained within or outside its burrow was tested using a t test for paired samples, in five different combinations: (a) total time within the burrow vs. outside, (b) time within the burrow during the day vs. at night, (c) time outside the burrow during the day vs. at night, (d) nighttime within the burrow vs. nighttime outside the burrow, and (e) daytime within the burrow vs. daytime outside the burrow. All tests were performed with the BioEstat 5.3 software (Ayres et al. 2007). Lastly, each individual was tested for circadian activity using Rayleigh's Z test, performed with the software Oriana 4.0 (Kovach 1994). For this analysis, activity was considered as the total time spent in exploration behaviors (Table 2), in seconds. All data were evaluated for homoscedasticity with the Levene test and for normality with the Shapiro-Wilk test. All p values of < 0.05 were considered significant. All animals were sampled, maintained, and returned to the natural environment under license from IBAMA (Instituto Brasileiro do Meio Ambiente), number 14180-1, granted on December 4, 2007 and according to the applicable statutes (law number 5197 of January 3, 1967; resolution number 16 of March 4, 1994 and number 332 of March 13, 1990). In total, 392 observation sessions were performed, totaling 28 h of sampling. All behaviors observed were then organized into six categories containing eight behavioral acts (Table 2). The most frequent act was ‘hiding within the burrow’, which comprised 54.9% of the total time, followed by ‘partial immobility’ (16.6%), and ‘total immobility’ (15.2%). Excavation of a burrow began in a few minutes after the crayfish were released into the aquaria, and extensively continued for the first two days of acclimation. Burrow morphology could be observed through the aquarium walls, and these were relatively complex, with a central chamber and usually more than one opening. Each crayfish built only a single burrow and spent more time inside than outside it (paired t test; t = 266.1; p < 0.0001); they also spent more time in the burrow during the day than during the night (paired t test; t =−124.9; p < 0.0001). However, they spent more time outside the burrow during the night than during the day (paired t test; t = 124.7; p < 0.0001). During the night, the crayfish spent significantly more time inside than outside the burrow, the same relationship being found during the daytime analysis (paired t test; t = 17.5; p < 0.0001; t = 40.6; p < 0.0001, respectively) (Figure 1). The circular analysis indicated that all of the animals showed a clear circadian rhythm, with higher activity during the twilight and night periods (Figure 2). Activity was concentrated from 1851 until 2251 h (Table 1, Figure 2). Values of Z and p for the circular analyses are shown in Table 1. Parastacus brasiliensis : time (seconds ± standard deviation) spent inside and outside the burrow. Gray bars denote nighttime and white bars daytime. An asterisk indicates a significant difference between daytime and nighttime according to a paired t test (p < 0.05). The letter ‘a’ indicates a significant difference between the white and gray bars with the same test. Parastacus brasiliensis : Circadian activity of the seven crayfish monitored for 7 days. Bars represent time (s) active outside the burrows, and vectors indicate the means and 95% confidence intervals. In general, all of the observed behaviors corresponded to most of the common behaviors usually associated with crayfish (Table 2) (Gherardi 2002; Lundberg 2004), with the only behavioral act that deserved more attention being burrowing. Despite being a very common behavior, even in species typically considered non-burrowers (Berril and Chenoweth 1982), the readiness with which P. brasiliensis began to burrow needs to be highlighted. All of the crayfish burrowed extensively during the first two days of acclimation to the experimental conditions. Although this comprised a small proportion of all behaviors during the sampling period (2.3%), it was common to all animals throughout the experiment: the crayfish performed maintenance and constantly expanded their burrows. Burrow morphology seemed similar to those of type 1b, according to Horwitz and Richardson (1986). This type is usually associated with tertiary burrowers such as Procambarus clarkii (Huner 2002) and is relatively rudimentary compared to that of primary burrowers, such as P. defossus, which always has more than one branch and is deeper than those observed in this experiment (Noro and Buckup 2010). However, this apparent simplicity is probably a result of our experimental design, with a limited area that could be excavated. In addition, the permanent water could have prevented the animals from excavating more complex burrows (Hamr and Richardson 1994 Noro and Buckup 2010), and thus, we cannot accurately infer about the extent to which P. brasiliensis would burrow in natural habitats. Grooming behavior, where the animal uses its chelipeds and/or pereiopods to remove epibionts and prevent body fouling, is common in many species of decapods (Bauer 1981, 2002 Zimmermann et al. 2009). Grooming, presumably associated with cleaning of the body surfaces, occurred at a very low frequency (0.3%). This is not surprising, given that Bauer (1981) showed that this behavior is common to many shrimp, but only poorly developed in reptant decapods. Further studies in crayfish demonstrated that grooming is ineffective in preventing body fouling (Bauer 2002). Given this low effectiveness and the high incidence of temnocephalid epibionts on captured specimens of P. brasiliensis (M Dalosto, personal observation), it is not surprising that the animals do not spend much time grooming. The association of these crayfish with their burrows was very clear, as hiding in the burrow was by far the most frequent behavioral act (54.9%, Table 2). Crayfish remained hidden within their burrows most of the time, during both day and night (Table 2, Figure 1). Even during the night phase, when the crayfish spent more time outside the burrow than during the day, they still spent significantly more time in the burrow (Figure 1). When foraging, crayfish would usually find and clasp a food item and, in most cases, would return to the burrow before consuming it (A Palaoro, personal observation). This pattern indicates a cryptic life habit, which is probably an anti-predatory adaptation (Bühler and Barros 2007; Gusmão-Júnior et al. 2012. It is somewhat analogous to what was assumed for the freshwater crab Trichodactylus panoplus (von Martens, 1869), which uses a strategy of immobility along with burying itself in the substrate, instead of burrowing (Zimmermann et al. 2009). Alternatively, long periods within burrows can reduce interspecific competition with other freshwater decapods, such as the freshwater anomurans of the genus Aegla Leach, 1820, occasionally found in sympatry with Parastacus (Morrone and Lopretto 1994 Dalosto and Santos 2011) and which are aggressive and highly mobile animals (similarly to surface water crayfish) (Ayres-Peres et al. 2011a, 2011b; Palaoro et al. 2013). 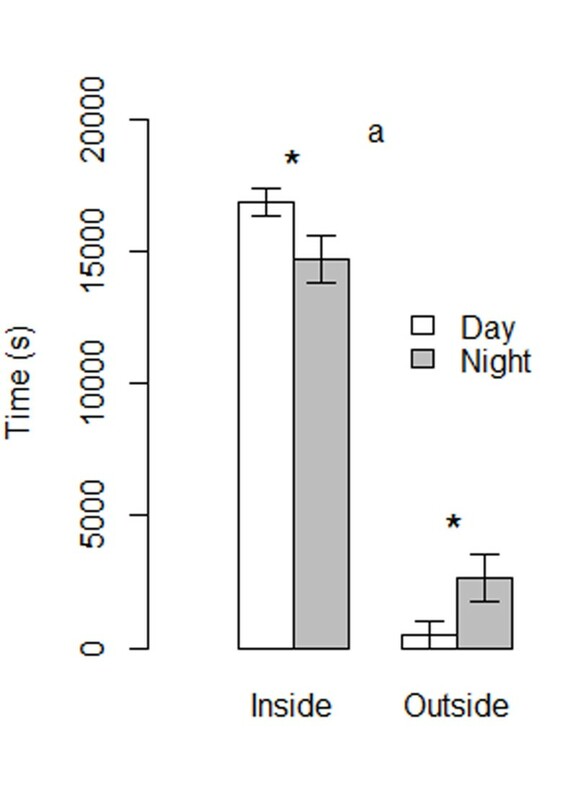 The circular analyses indicated that all animals showed circadian activity, with a peak during night hours (Figure 2, Table 1). Preferring nocturnal activity is a common pattern among many species of decapods (Vaninni and Cannicci 1995), as also reported for freshwater crabs (Zimmermann et al. 2009), aeglids (Sokolowicz et al. 2007), and many crayfishes (Lozán 2000; Gherardi 2002; Lundberg 2004; Musil et al. 2010). When exploring the area outside the burrow (9.1% of all behaviors), a crayfish would walk through the aquarium with its chelipeds held parallel to the substrate, occasionally touching it, and with very rapid movements of the antennae. This, along with the nocturnal activity and the small-sized eyes of this species (Buckup and Rossi 1980; Dalosto and Santos 2011; Dalosto et al. 2013) compared to other species such as the stream-dwelling South American parastacid Samastacus spinifrons (Philippi, 1882) (Rudolph 2002), indicate that tactile orientation probably is highly important for P. brasiliensis. Our results also support statements by several investigators that P. brasiliensis is nocturnal (Dalosto and Santos 2011; Dalosto et al. 2013), remaining in its burrow during the day and emerging at night to forage (Buckup 1999, 2003). The placement of the activity peak at the beginning of the night may be a statistical and methodological artifact. We only sampled activities four times a day, and the test calculated the peaks based on the sampling times. Nevertheless, the data provide robust evidence of the nocturnal activity of this crayfish. The results are clear: P. brasiliensis readily began excavating burrows and remained mostly hidden within them during the experimental phase (Table 2). This behavior would classify this crayfish as a ‘true’ burrower (primary or secondary burrower), according to Hobbs' (1942) classification. However, the animals also spent a considerable proportion of their time in exploration activities outside the burrow (9.1%). Along with recurrent observations in the literature associating this species with small streams, this would classify it as a secondary burrower: a crayfish strongly associated with its burrow but exhibiting considerable activity outside it, especially when the water table rises (Hobbs 1942, 1981). Additionally, the structure of the burrows excavated, mostly with more than one opening both above and below the water level, can be classified as type 1b (i.e., burrow connected to the water with openings above the water level) according to the system proposed by Horwitz and Richardson (1986). These are usually associated with more vagile species such as Cherax destructor Clark, 1936 (Horwitz and Richardson 1986). These results, however, must be interpreted with caution. It is possible that these crayfish did not forage for long periods because the portion of the aquarium filled with water simply did not offer any resource motivating them to leave the burrow (Tierney and Atema 1988; Breithaupt et al. 1995; Gherardi 2002; Metillo, 2011), as food was offered on only a few occasions. Alternatively, the crayfish might have dug a much more complex burrow system if they had been allowed more space to do so. With a deeper, more complex burrow, the need for excursions into the open water would decrease (Hamr and Richardson 1994; Richardson 2007). Additionally, Hobbs (1981) stated that a species of crayfish rarely belongs to a single class of burrower. A clear example of this is Fallicambarus fodiens (Cottle 1863), which has been classified alternately as a primary or a secondary burrower, according to the study area (Norrocky 1991; Hobbs and Whiteman 1991; Trepánier and Dunham 1999; Punzalan et al. 2001; Guiaşu et al. 2005). It also must be noted that these classification systems for crayfish burrowing habits (Hobbs 1942) and burrows (Horwitz and Richardson 1986) were designed specifically for North American and Australian faunas. The South American crayfish fauna possesses a disproportionately high prevalence of burrowers, and investigations of their ecology can update and refine these classification systems so that we can analyze crayfish ecology within the same framework, including burrowing crayfish from all radiations (Morrone and Lopretto 1994; Taylor 2002; Collins et al. 2011; Dalosto and Santos 2011; Dalosto et al. 2012, 2013). Given this, it is important that the habits and basic biology of the Neotropical fauna be studied, since they remain largely unknown. Parastacus brasiliensis is indeed a nocturnal animal, leaving its burrow mainly to forage and possibly to mate. This species is more closely associated with its burrows than previously thought and clearly does not belong to the group of true lotic crayfish. It also has the potential to switch its habits depending on the situation. This pattern was seen in the time spent inside the burrow and in the complex burrow system excavated by the animals over a relatively short period of time. It is important to continue studies on the ecology of these freshwater crustaceans in order to improve our understanding of their behavior. 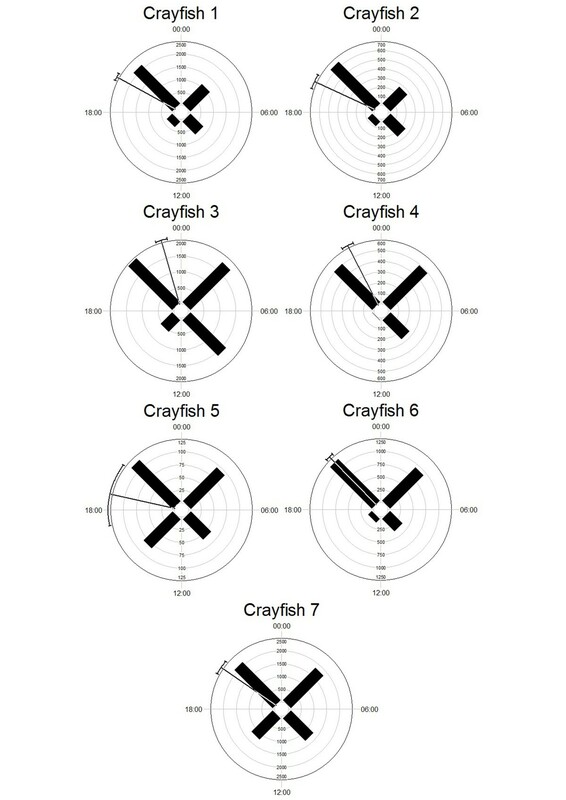 We also highlight the difficulty of fitting this species into the classification systems developed for crayfish with different traits. The studied species builds burrows apparently similar to those of tertiary burrowers, but its morphology, with a small abdomen and eyes, short rostrum, and vertically oriented chelipeds, is clearly similar to that of semi-terrestrial species (Richardson 2007). P. brasiliensis is indeed a true burrower, spending most of the time within its burrow, which clearly plays a central role in the ecology of this species. The authors are grateful to K Pinheiro, K Drehmer, and L Ayres-Peres for their help with the experiments, and two anonymous reviewers for their suggestions that substantially improved the manuscript. We are also grateful to CNPq for the scholarship and the productivity grant awarded to AVP and SS, respectively, and to CAPES/FAPERGS for the doctoral scholarship awarded to MMD. AVP participated in the design of the study, the collection of the animals, the execution of the experiment, the statistical analyses, and drafting the manuscript. MMD participated in the collection of the animals, the statistical analyses, and drafting the manuscript. CC participated in the design of the study and the execution of the experiment. SS participated in the design of the study, the coordination, and drafting the manuscript. All authors read and approved the final manuscript.